ReNu MultiPlus is a multi-purpose solution for removing protein deposits and disinfecting. This solution is suitable for all types of soft contact lenses. ReNu MultiPlus solution contains ingredients to help increase hydration and comfort. Gelone solution is an innovative, multipurpose contact lens solution that contains sodium hyaluronate for exceptional moisture. Each 360 ml bottle of Gelone solution contains an antibacterial lens case. 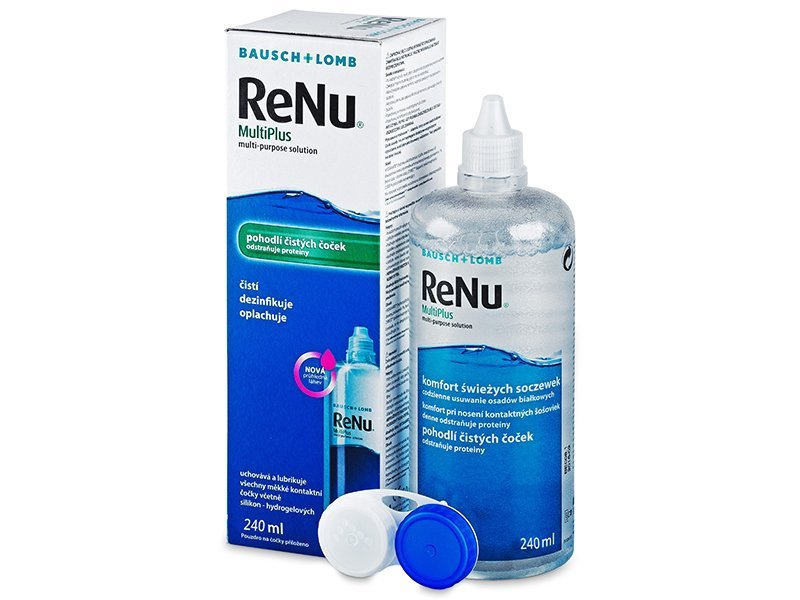 ReNu MultiPlus is a multi-purpose solution for removing protein deposits, rinsing and disinfecting your contact lenses. Manufactured by Bausch and Lomb. ReNu Multi Plus solution is suitable for all types of soft contact lenses. Although ReNu Multi Plus is marked as „NO RUB,“ we recommend that you rub your lenses between your thumb and index finger or your palm and index finger. Contact lens care is then more effective. ReNu MultiPlus solution contains ingredients uniquely developed to remove protein deposits from the contact lens surface. We also sell this multi-purpose solution in packs of 120 ml, 360 ml, 2x360 ml and 3x360 ml. This package contains one 240 ml bottle of ReNu MultiPlus Solution and one contact lens case. Does this solution have boric acid ?? Hi, According to Bausch+Lomb, this solution does indeed contain boric acid.